I wanted to update Two Point Five (a little 2.5d first person demo thing I had done) a bit. But it seemed to have been one of the two or three Wii games that I forgot to backup before a past hard drive reformat and windows reinstall. So instead I just remade it. Its pretty much the same but with a few improvements and additions. 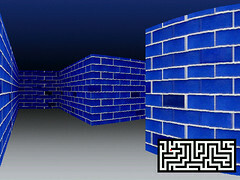 The walls are textured (the texture used is ‘Blue ceramic wall seamless tile’ by aubergene), there is collision detection and also classic controller support. It didn’t really take long remaking it. Starting from scratch isn’t really a big deal when you aren’t actually starting from scratch. Its a collage of borrowed code. 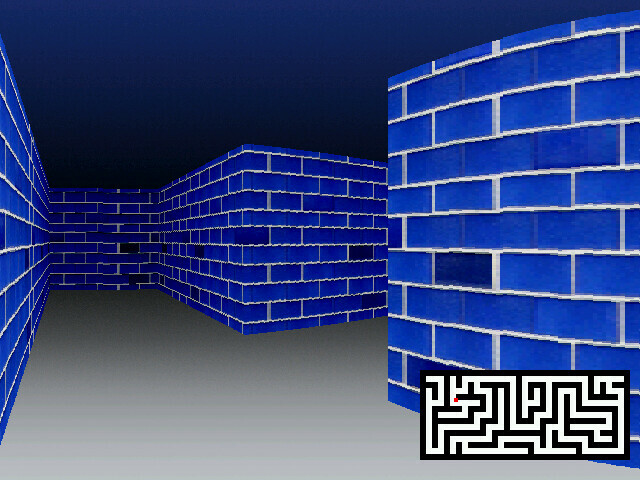 As with the original Two Point Five the level is generated using the same maze generation function I wrote for my Aptly named Maze Generator. With the original it was my first time doing anything with raytracing and what I ended up writing involved a ton of trigonometry (which is slow) but this time I just borrowed from James McNeill‘s awesome grid based raytracing example. The collision detection is exactly the same as it is in the more recent release of Maze Generator which is essentially the same nice circle on square collision system I wrote for Swing Ball and have been using for pretty much everything since. I don’t know about a 3D version of They Do Not Die but I can definitely envision having some form of shooter on Wii built from this. I’m going to return to it later and see how much I can improve upon it.